"Li Gong" redirects here. For the computer scientist, see Li Gong (computer scientist). This is a Chinese name; the family name is Gong. Gong Li (born 31 December 1965) is a Chinese-born Singaporean film actress. She achieved international prominence through her close collaborations with Chinese director Zhang Yimou (Yimou girl) and won the Volpi Cup for Best Actress at Venice for her performance in his 1992 film The Story of Qiu Ju. She has been credited with helping to bring Chinese cinema to prominence in Europe and the United States. In 2006, she was voted the most beautiful woman in China. Gong Li was born in Shenyang, Liaoning, China, the youngest of five children. Her father was a professor of economics and her mother was a teacher. She grew up in Jinan, the capital of Shandong. In 1985, she was accepted to study at the Central Academy of Drama in Beijing; she graduated in 1989. While a student at the Central Academy of Drama, she was discovered by Zhang Yimou, who chose her for the lead role in Red Sorghum, his first film as a director. Over the several years following her 1987 acting debut in Red Sorghum, Gong received international acclaim for her roles in several more Zhang Yimou films. She starred in Ju Dou in 1990; her performance in the Oscar-nominated Raise the Red Lantern (1991) put her in the international spotlight; she was named Best Actress at the Venice Film Festival for her performance in The Story of Qiu Ju (1992). These roles established her reputation, according to Asiaweek, as "one of the world's most glamorous movie stars and an elegant throwback to Hollywood's golden era". In many of her early movies, Gong represents a tragic victim and an abused soul (physically or emotionally), trying to release herself from an impossible maze of corruption, violence and suppression. In Raise the Red Lantern and Shanghai Triad (1995) an additional tragic element is added to her being as she unintentionally becomes the executioner of new innocent victims, making her realize that she has assisted the dark cynical system. In 1993, she received a New York Film Critics Circle award for her role in Farewell My Concubine (1993). Directed by Chen Kaige, the film was her first major role with a director other than Zhang Yimou. In the same year, she was awarded with the Berlinale Camera at the 43rd Berlin International Film Festival. Premiere magazine ranked her performance in Farewell My Concubine as the 89th greatest performance of all time. She also worked with renowned director Stephen Chow in comedy films God of Gamblers III: Back to Shanghai (1991) and Flirting Scholar (1993). Immune to political repercussions because of her fame, Gong Li began criticizing the censorship policy in China. Her films Farewell My Concubine and The Story of Qiu Ju were initially banned in China for being thinly-veiled critiques of the Chinese government. Regarding the sexual content in Ju Dou, Chinese censorship deemed the film "a bad influence on the physical and spiritual health of young people." In June 1998, Gong Li became a recipient of France's Ordre des Arts et des Lettres. Two years later, she was invited by the Berlin Film Festival to be the president of its international jury for the festival's 50th anniversary (2001 February). 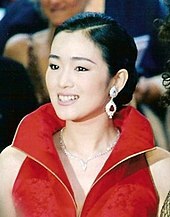 Gong won her second international Best Actress trophy for her performance as a struggling single mother in Breaking the Silence (2000) at the Montreal Film Festival, directed by Sun Zhou. She was invited to head the Venice Film Festival in 2002. In the early 2000s, Gong also starred in two films directed by Wong Kar-wai, 2046 and Eros (both in 2004). She attended the Cannes Film Festival that year, where she was awarded the Festival Trophy for her contributions to film. Despite her popularity, Gong avoided Hollywood for years, due to a lack of confidence in speaking English. She made her English speaking debut in 2005 when she starred as Hatsumomo in Memoirs of a Geisha. Her performance was met with generally positive reviews. Her other English-language roles to date included Miami Vice in 2006 and Hannibal Rising in 2007. In all three films, she learned her English lines phonetically. She worked again with Zhang Yimou for historical epic Curse of the Golden Flower (2006). Time named her performance as the Empress as the 7th greatest performance of the year. She narrated Beijing (2008), an audio walking tour by Louis Vuitton and Soundwalk, which won an Audie Award for Best Original Work in 2009. In 2010, Gong starred in the World War II-era thriller Shanghai as a spy who disguises as the wife of a triad boss (played by Chow Yun-fat). She turned to documentaries and photographs about World War II, besides taking dancing classes three times a week, to ensure an accurate portrayal of the character. During a press junket for the film, she stated that she was becoming more selective with the Chinese language projects offered to her. In 2014, Gong was the president of the jury for the 17th Shanghai International Film Festival. Later that same year, she reunited with Zhang Yimou for the film Coming Home, which is set during the throes of the Cultural Revolution; this film was their first collaboration since 2006. In 2016, Gong took on her first action role in The Monkey King 2, playing the White Bone Demon. In 2018, Gong was cast in Lou Ye's period drama Saturday Fiction, where she plays an actress who is working undercover gathering intelligence for the Allies. That year, she was also cast in the live-action adaptation of the 1998 Disney animated film Mulan, as an unspecified villain. Her personal and professional relationship with director Zhang Yimou has been highly publicized. The pair collaborated on six films between 1987 and 1995, before ending their relationship. They reunited in 2006 for the film Curse of the Golden Flower and in 2014 on Coming Home. In November 1996, Gong married Singaporean tobacco tycoon Ooi Hoe Seong at Hong Kong's China Club. On 28 June 2010, Gong's agent confirmed that Gong Li and her husband had divorced. Gong was nominated Goodwill Ambassador of the Food and Agriculture Organization of the United Nations (FAO) on 16 October 2000. In 2006, she was voted the most beautiful woman in China. Gong applied for Singapore citizenship in early 2008. When overseas professional obligations prevented her from showing up at her scheduled August citizenship ceremony, she was harshly criticized for not making it a priority. On Saturday, 8 November 2008, Gong, in an effort to make amends, attended a citizenship ceremony held at Teck Ghee Community Club and received her Singapore citizenship certificate from Member of Parliament Lee Bee Wah. ^ Kehr, Dave (16 July 2004). "Torn Between a Dreamy Idealist and a Veterinarian". The New York Times. Retrieved 7 January 2008. ^ a b "Gong Li voted China's Most Beautiful Person". China Daily. 23 May 2006. Retrieved 17 March 2007. ^ a b Min, Shen (22 May 2006). "Gong Li Voted China's Most Beautiful Star". Retrieved 17 March 2007. ^ a b "FILM; A Chinese Actress Blossoms on the Screen". The New York Times. ^ "N.Y. Writers Pick 'List' but Bypass Spielberg : Movies: Film Critics Circle echoes its L.A. counterpart by naming 'Schindler's List' the best work of 1993 and 'The Piano's' Jane Campion best director". Los Angeles Times. ^ a b "'I don't fear mistakes': Gong Li". China Daily. ^ "Gong Li wants to be a better Chow Heung". Yahoo News. ^ Kelly, Brendan (5 September 2000). "Montreal fest dawns an age of 'Innocence'". Variety. Retrieved 6 December 2018. ^ "Gong Li heads Venice festival jury". The Guardian. ^ "Gong Li says she is a versatile actress". China Daily. ^ "The Women of Geisha – EW.com". Entertainment Weekly. ^ Soundwalk. Retrieved 17 September 2009. ^ Audio Publishers Association. Retrieved 20 September 2009. ^ "Chinese Actress Gong Li to Chair Jury at Shanghai Film Festival". The Hollywood Reporter. ^ "Gong Li and Zhang Yimou Reunite in Coming Home". The Huffington Post. ^ "Gong Li gets a kick out of playing evil in The Monkey King 2". The Straits Times. ^ "First look: Lou Ye's period drama 'Saturday Fiction' (exclusive)". Screen Daily. 16 February 2018. ^ "Disney's Live-Action 'Mulan' Lands Gong Li, Jet Li (Exclusive)". The Hollywood Reporter. 12 April 2018. ^ "Zhang Yimou's daughter accuses Gong Li of ruining her childhood". AsiaOne. Singapore Press Holdings. 19 August 2009. Archived from the original on 11 April 2015. Retrieved 3 April 2015. ^ Feinstein, Howard (16 June 2000). "Life after Gong Li". The Guardian. Retrieved 3 April 2015. ^ Barber, Lynden (25 February 2015). "Favourite star Gong Li shines for Zhang Yimou". The Australian. Retrieved 3 April 2015. ^ "Gong Li 'divorces Singaporean husband'". The Telegraph. ^ "Gong Li". Food and Agriculture Organization. Archived from the original on 7 August 2009. Retrieved 16 September 2009. ^ "Gong Li becomes a Singaporean". The Straits Times. Singapore Press Holdings. 10 November 2008. Archived from the original on 11 April 2015. Retrieved 3 April 2015 – via AsiaOne. Wikimedia Commons has media related to Gong Li.